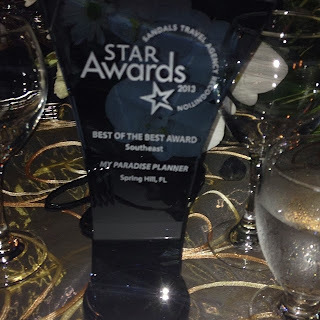 Last week, two of our Paradise Planners-- Kira Solomon (our owner) and Robert Solomon-- packed up their suitcases and made their way down to the Sandals Travel Agency Recognition (STAR) Awards. Honored to just be invited, they spent the week enjoying the scheduled activities such as a Beach Party Extravaganza, a Chocolate Buffet, and a Sandals Foundation Christmas Party. 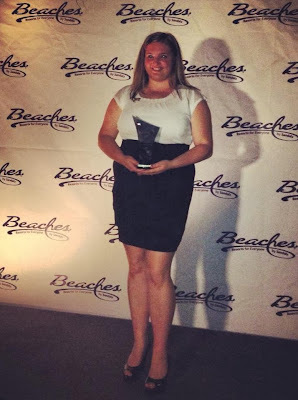 Beaches Turks and Caicos did an amazing job hosting over 400 people for all the scheduled events including the most important event of the week... the award gala. Among the top travel agents receiving awards, the guest list included the Chairman of Sandals, Mr. Gordon "Butch" Stewart"; the CEO, Adam Stewart; the Prime Minister of the Turks and Caicos islands; and many Sandals & Beaches staff members. 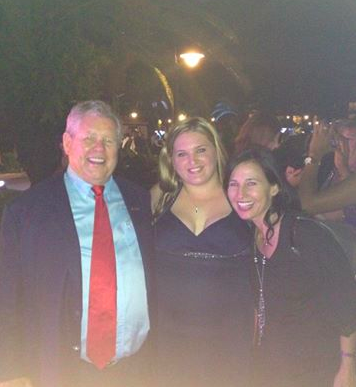 And Julie Stephan, Senior Regional Manager for the Southeast USA. 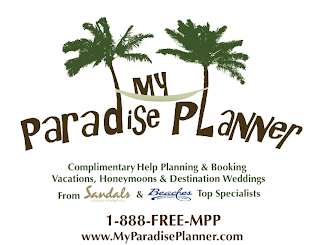 Our Paradise Planners watched in awe as the show started with orchestra fanfare music and the official masters of ceremony came out and began the award presentations. Our company had started the night off with a bang with Kira having won the award for "Outstanding Sales Achievement" at the pre-show dinner the evening before. This award was given to agents who surpassed the goals set for them by their local Sandals sales reps.
Kira on stage after receiving the "Outstanding Sales Achievement" award. A glass of champagne to celebrate this huge honor! 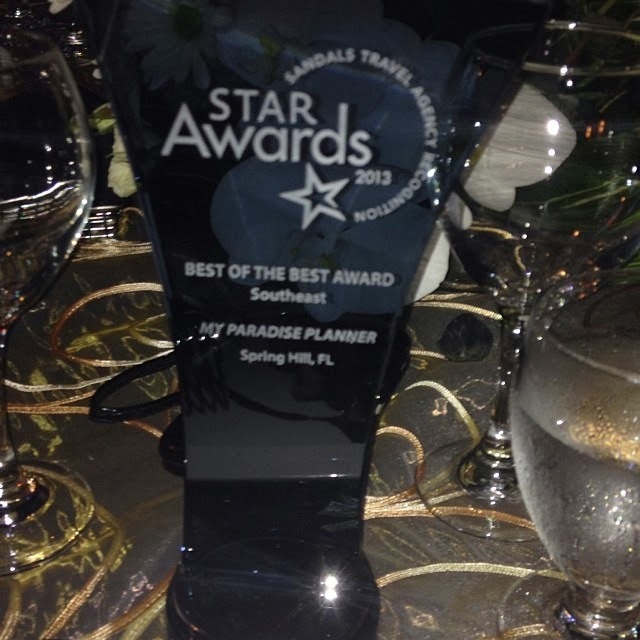 By the end of the night, My Paradise Planner had also received an award for "Best of the Best" agency in the Southeast Region of the USA. 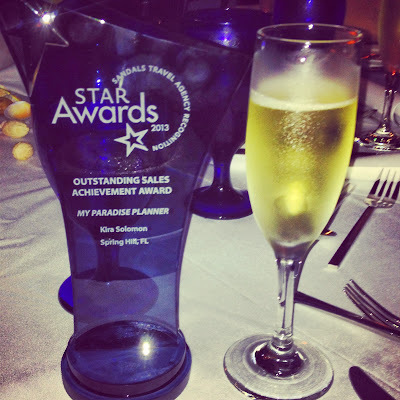 This award was given to the agencies with the highest sales in their region. But the icing on the cake was when the CEO, Adam Stewart, and the social media manager, Tiffany Mullins presented Kira with the first ever Sandals and Beaches Resorts "Social Media Award"! 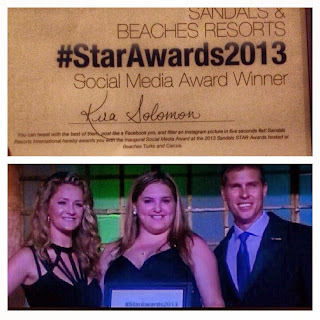 This award was given to Kira based on her dedication and commitment to supporting and interacting with Sandals and Beaches Resorts through various forms of social media, not just during the STAR awards event but since the start of our company. After an amazing ceremony and lots of big wins, all guests in attendance were treated to a fireworks display-- a perfect end to a fantastic night for My Paradise Planner! We're so proud and honored to be acknowledged by Sandals for our hard work and dedication to selling their brand. 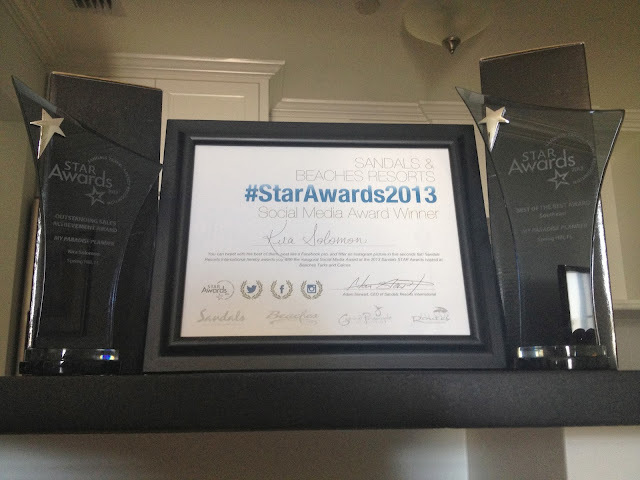 These awards that we will now proudly display, show our love of selling the BEST resort chain in the WORLD, but our commitment to making sure our clients experience the best vacation, honeymoon, or destination wedding possible when they visit these resorts-- of course, at no extra cost to them.